Explore Port Douglas' surroundings by going to Cape Tribulation (Daintree Rainforest - Cooper Creek Wilderness, Daintree Entomological museum, & more), Cairns (Scuba & Snorkeling, Esplanade Lagoon Pool, & more) and Alexandra Bay Waterfall (in Diwan). Spend the 15th (Fri) spotting exotic species with a safari tour. There's much more to do: experience rural life at Hartley's Crocodile Adventures, head outdoors with Eye to Eye Marine Encounters, kick back and relax at Palm Cove Beach, and tour the pleasant surroundings at Trinity Beach. To see photos, other places to visit, more things to do, and other tourist information, go to the Port Douglas tour planning site . London, UK to Port Douglas is an approximately 26-hour combination of flight and shuttle. You can also do a combination of flight, car, and ferry. The time zone changes from Greenwich Mean Time to Australian Eastern Standard Time (Queensland), which is usually a 10 hour difference. Prepare for much warmer weather when traveling from London in February: high temperatures in Port Douglas hover around 36°C and lows are around 28°C. Wrap up your sightseeing on the 1st (Fri) to allow time to travel to Sydney. Venture out of the city with trips to Gallery Blackheath (in Blackheath), Katoomba (Wentworth Falls & The Three Sisters) and Norman Lindsay Gallery & Museum (in Faulconbridge). Spend the 8th (Fri) exploring nature at Sydney Harbour National Park. 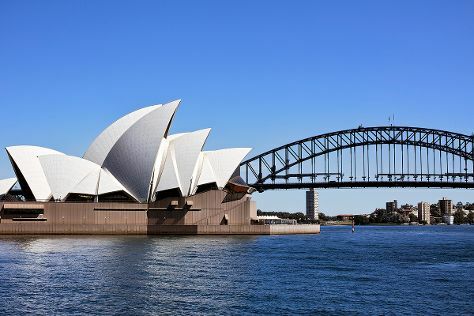 And it doesn't end there: see a show at Sydney Opera House, hike along Bondi to Coogee Beach Coastal Walk, kick back and relax at Coogee Beach, and wander the streets of Darling Harbour. For other places to visit, maps, ratings, and other tourist information, use the Sydney trip app . Getting from Port Douglas to Sydney by combination of shuttle and flight takes about 7 hours. Other options: drive; or do a combination of bus and train. Prepare for slightly colder weather when traveling from Port Douglas in March: high temperatures in Sydney hover around 30°C and lows are around 22°C. You'll set off for home on the 20th (Wed).